Through play, children in Skanderborg are learning the importance of sustainable behavior and how they can contribute to a greener world. turn the municipality’s little ones into the green climate action heroes of the future. Through games, songs, contests and stories, the children learn about how to reduce food waste, sort waste, and respect nature, as well as how to upcycle old products into toys and art. into their day-to-day operations. The result? The nurseries have reduced their energy bills, improved recycling rates, reduced food waste and introduced more sustainable options on the lunch menu. However, knowledge sharing is not limited to the institutions alone: the children come home with new habits and knowledge, thereby having a positive impact on the actions of their parents as well. In 2017, the final exhibition was held at the town hall. 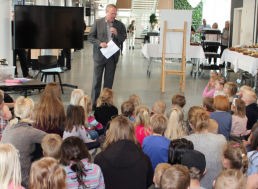 The mayor opened the exhibition, which involved children from all the nurseries in the project. Engaging children in their own futures is essential to achieving a more sustainable world. Through this project, kids learn from a young age how sustainable lifestyles can be achieved. Children are encouraged to reduce their food waste through competitions. A nursery that reduces food waste by 2% corresponds to a saving of 10kg of food per child. The children have learned about waste management by visiting the local waste company, hearing stories from the local museum and putting on exhibitions at nursing homes.